SWAPPED SPORTS. The girls and guys show off their skills on the field and court. Homecoming week is always filled with fun activities in order to increase school spirit leading up to the game Friday night. 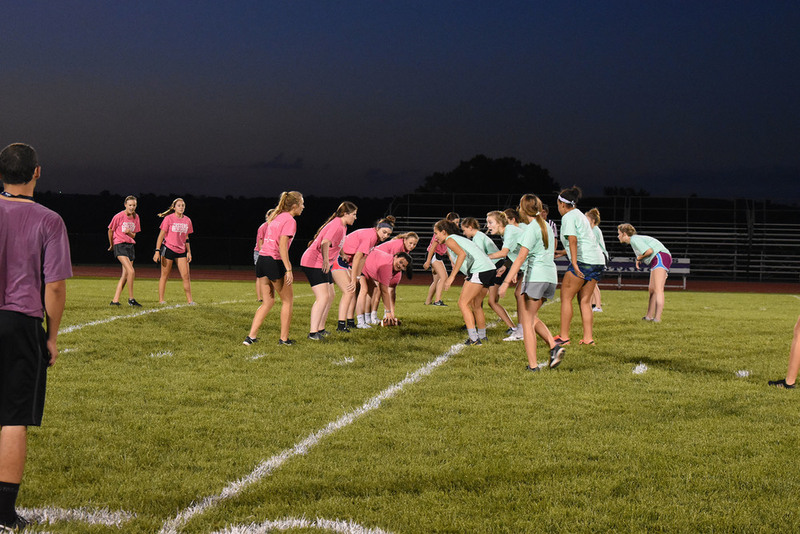 Student Council and Fellowship of Christian Athletes hosted Powderpuff and “Spikefest” on Wednesday, September 12. The night kicked off with a meal provided by FCA and a lesson given by one of the sponsors, Joe Zimmerman. From there, participants started the festivities with the boys playing a volleyball game in the gym. 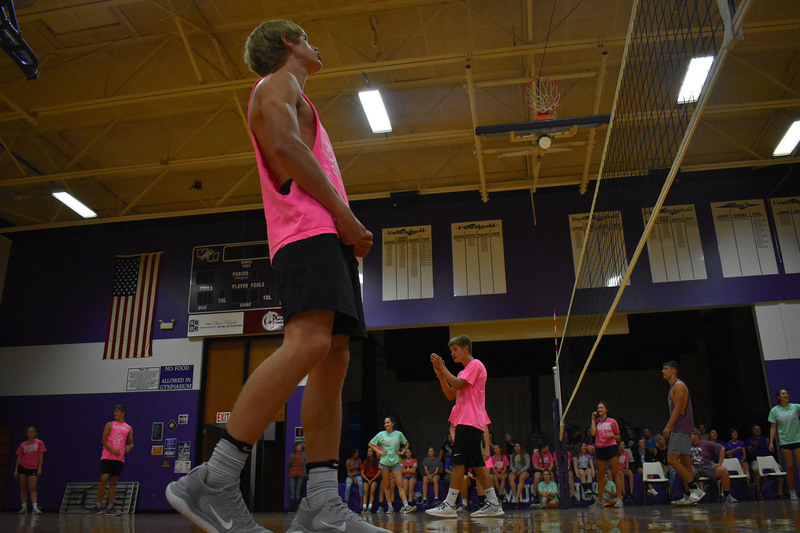 This year, it was suggested that the boys play a game of volleyball called “Spikefest.” The teams were split into seniors and freshmen against the juniors and sophomores. Coaches and officials are members of the Valley Heights Mustang volleyball team. When the intense game of Spikefest started, the boys were unsure of some rules and regulations but quickly gained confidence and began dominating. The juniors and sophomores (pink team) quickly came out on top of the freshmen and seniors (purple team) in the first set, winning easily. However, the purple team came back and won the second set. In the final set to ten points, the pink team barely beat the purple team, 10-7. “It was interesting doing something different. Volleyball is a lot more complicated than I originally thought,” said sophomore, Jake Yungeberg. After the exciting opening of Spikefest, the crowd that had formed on the stage in the gym shifted to the football field to support the girls. The Seniors and Freshmen (green team) were led by senior, Payden Yungeberg and the juniors and sophomores (pink team) were coached by senior, Konner Treff. With only ten minute halves and a running clock, each team had little time to score. With only two minutes left, the green team pushed down the field, running out of time with the final throw. The ending score was 6-0, pink team. “I’m glad we won again, the pink team is back-to-back champions, so we have a ‘title’ to defend next year,” explains Shae Murk, junior.